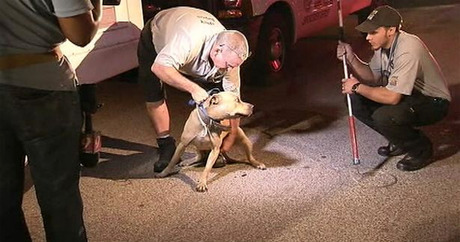 Tuesday night, after a lengthy investigation sparked by an anonymous tip, authorities in Apopka, Florida, initiated a raid on a confirmed dogfighting operation. Apopka Police Department spokesperson Sergeant Kim Walsh tells the Orlando Sentinel that while the men involved in the operation thought of dogfighting as merely a gambling sport, what she and the other officers discovered in the raid would have made most people cringe. “The rest of us would consider this cruel and inhumane,” she says. The orchestrated bust occurred while an actual dogfight was in progress, according to WESH Orlando. Police arrived on the scene around 9:30 p.m. to find a long line of parked cars outside of the residence. Looking closer, officers discovered more than a dozen dogs inside of those cars, dogs awaiting — or more likely, dreading — their turn in the ring. As the authorities made their way to the backyard of the home, they discovered nearly 40 people crowded around a makeshift fighting ring, including two young children brought to the fight by their parents. The crowd scattered, many of the blood sport spectators abandoning their dogs in their cars or setting them free in the neighborhood as they tried to thwart the police. “We made an announcement t everyone that was involved, and everyone on the premises tried to run. Individuals [were] running in this neighborhood. We set up a perimeter to apprehend as many as we possibly could,” Sgt. Walsh explains. When all was said and done, 26 people were arrested, most by force. Seven of those apprehended were injured trying to flee, police say. Four of those detained had to be subdued with a stun gun, and one was caught by a police K-9. The rest hurt themselves by falling as they tried to avoid the police. The children watching the fight, one as young as 5-years-old, have since been released into their grandparents’ custody. Animal Control officers helped to round up the dogs involved in the fight, most of them Pit Bull Terriers, including many who were gravely injured. One dog had to be brought out on a stretcher because he was unable to move. Authorities believe this dog was used in the first of four dogfights held at the home that night. “They fought the dogs to the death,” Sgt. Walsh says. In all, roughly 17 dogs were taken from the property that night. Apopka Police Chief Robert Manley says the dogs were not aggressive with people at all, but behaved as they were trained to, wanting to kill other dogs. Investigators also discovered caged rabbits chickens, and even raccoons in the backyard. They also found a mother dog and a litter of puppies. Sgt. Walsh says equipment discovered at the residence indicates that this was a sophisticated dogfighting operation. Neighbors seemed shocked that such a terrible activity had been going on in their neck of the woods. “I think it’s real crazy. It’s real crazy,” neighbor Darren Hopper tells ClickOrlando.com. It is not yet known whether any of the dogs will be able to be rehabilitated, but the investigation into the dogfighting operation continues today. Apopka Police say there are still about 10 more dogs inside the home itself. They plan to obtain and execute a search warrant to remove those dogs from the property.